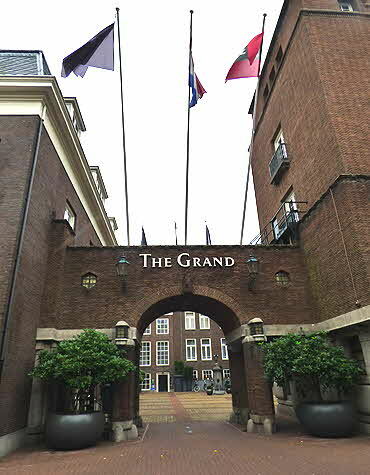 The Grand Hotel Amsterdam states a truism in its name, for this hotel is truly grand. The oldest part of the building dates to 1411 and its history includes housing a convent; a Royal lodging; the Dutch Admiralty; City Hall of Amsterdam; and now a five-star deluxe luxury hotel. Thankfully, its recent transition to a Sofitel Legend hotel under the guidance of famous French interior architect Sybille de Margerie, managed to integrate all of the architectural features of its historic march through time into a modern-day hospitality venue updated with 21st century amenities. Fashionably located facing the Oudezijds Voorburgwal (canal) the entrance is through a “grand” courtyard. The building to the left was the Saint Cecilia convent and Catharina Monastery which in 1581 played host to Prince William of Orange and in 1632 the French Queen Maria de Medici. After the Reformation, it was converted into the Admiralty headquarters and afterward for almost two hundred years it functioned as Amsterdam’s City Hall. Finally in 1992 it was restored and opened as The Grand Hotel. In 2011 after extensive renovations, The Grand became a Sofitel Legend hotel, the first in Europe. The courtyard that once played host to horse-drawn carriages nowadays entertains sleek luxury vehicles, but with the same time-honored liveried doorman greeting and assist from your vehicle into the waiting reception. You are welcomed like a returning friend and shown to one of the 177 guestrooms or 52 suites with Butler service, each individually decorated in soft elegant natural tones and rich materials. Heads of state and celebrities often stay in one of the spacious and well appointed suites or in the Canal House Suites which are more like a private home than a hotel suite. The twelve Canal House Suites were formerly official residences of famous Dutch admirals, when the main building was the Admiralty headquarters during the 17thcentury. Several of the Canal House Suites have an individual separate entrance from the street but all offer complete privacy and security for visiting dignitaries or guests who prefer anonymity but with all the luxuries that a deluxe hotel can provide, including a Butler and Michelin star restaurant. Or if preferred, a guest can bring their own personal staff and/or cook and everything will be provided and the suite stocked according to the guest’s tastes. The hotel is so unique that daily sightseeing tours are offered to registered guests to explore this very special historic building. Especially appealing was that all of the staff we interacted with displayed enormous pride in this very grand hotel, including the Head Concierge Niels Essink, who leads a team which including himself, boats five members of the international organization of excellence Les Clefs d’Or. From the refined lobby you enter into the Library “OR” which is off the reception. The library is not only a place to relax around the fireplace but the venue for The Grand Afternoon Tea, or weather permitting, this delightful tradition can be enjoyed in the Garden Terrace. This is a full-blown traditional English afternoon tea with all the trimmings. Continuing on, we mount the elegant marble split-stairway with the stained-glass artwork leading to the upper floors Banqueting and Conference rooms. The Grand has some of the most beautiful public rooms I have ever seen. One called the Council Chamber is where H.R.H. Princess Beatrix of the Netherlands got married in 1966. But for the ultimate in special occasion venues, the Marriage Chamber takes your breath away and is available for marriage ceremonies or private dinners. 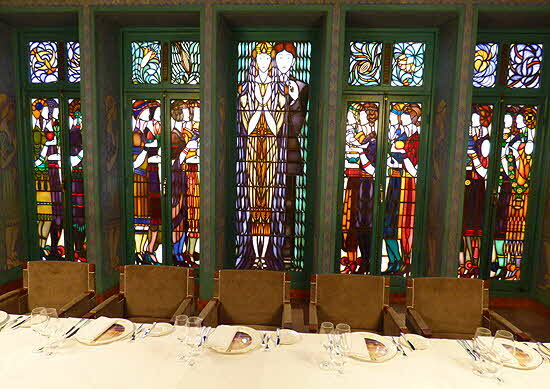 The Marriage Chamber was designed by Chris Lebeau (1878-1945) when the building was Amsterdam’s City Hall. The walls and ceiling are covered with delightful scenes of love and marriage and continued on the stained-glass windows that when opened reveal an interior garden view. Imagine a perfect wedding scene: sailing into the Oudezijds Canal, embarking and entering the grand courtyard and being led through the marble halls to this spectacular room to be married. Afterwards have your reception in the interior garden and spend your wedding night in one of the elegant suites... perfect! 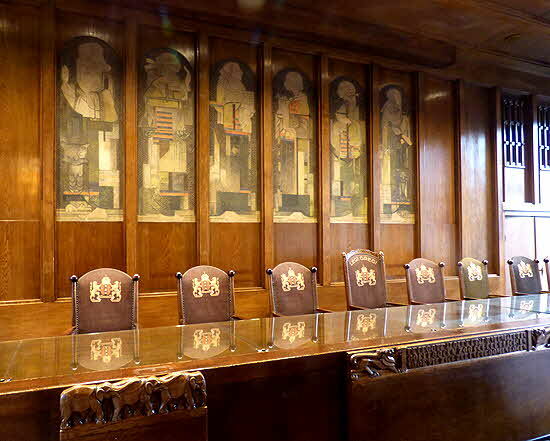 During the WWII Nazi occupation, the room was declared “Entartete Kunst” or degenerate art and it was covered over until in 1953 the Mayor of Amsterdam, Arnold J. d’Ailly, had the wallpaper removed to reveal once again the spectacular design. 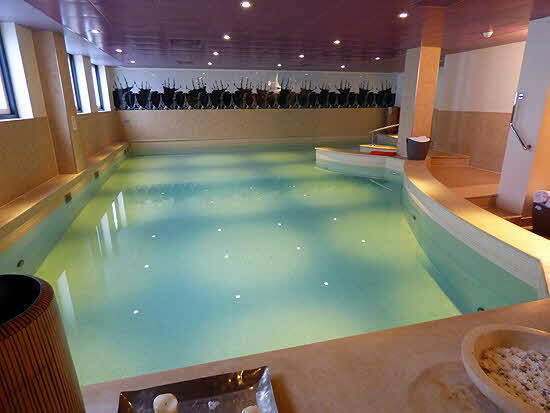 Nowadays no deluxe hotel is complete without a spa and at The Grand there is the SoSPA which houses an indoor heated swimming pool, Turkish Hamam, Jacuzzi and Sauna. There is a fitness room and of course rooms for different massage, facial and body treatments with elite French skincare products. The Michelin star restaurant Bridges can be entered from the hotel, but for diners not registered, there is a separate entrance from the street. The name “Bridges” refers to the fact that the restaurant fronts the river between two pedestrian bridges. 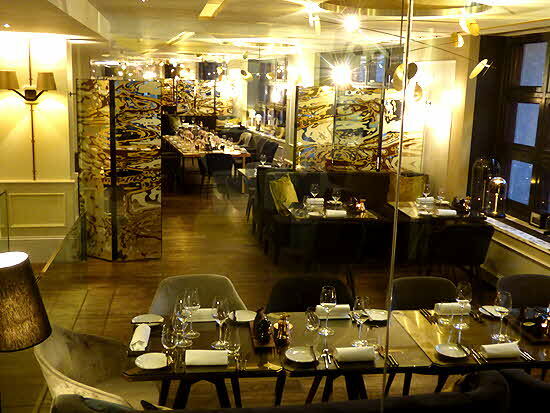 Bridges is a fish and seafood restaurant and their motto is taken from English writer Jonathan Swift’s comment that “Fish should swim three times: first in the sea, then in butter, and finally in good wine”. And so ends our memorable experience in the delightful city of Amsterdam.